Love this - Series 3 of 'Humans' is starting soon on Channel 4, and they've produced this 'Human Test', from the NSDU - National Synth Detection Unit - to see if you are a human or a 'synth'. Just say 'Start Human Test' to your Echo, or 'Talk to Human Test' on the Google Home. Netflix is on a roll at the moment. New shows or movies seemingly every day (or actually two every day - they have announced a plan to commission 700 this year), stats that kids in the UK prefer it to BBC iPlayer, and their shows are generating lots of buzz. 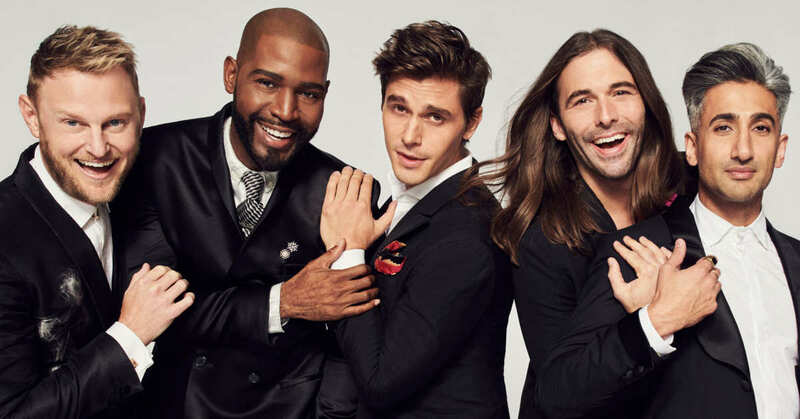 One recent show that I've seen is Queer Eye, the re-boot of the NBC make-over show from the early 2000s. It's a good show, if a bit focused on showing that all of life's problems can be solved by having a haircut, re-modelling your house, and spending lots of money on a new wardrobe. What's really interesting is that it's the first Netflix show I've seen to openly use product placement. Nothing that blatant, but you'd assume that the car company has paid, as have other manufacturers whose logos prominently appear during the show. Netflix has a policy of no advertising breaks and no sponsorship, but I suspect that this shows that they are now more open to commercial deals. I don't think ad breaks will come any time soon, but the increasing breadth of content, including chat shows, uses formats that people would be more willing to accept sponsorship for. It's hardly like they have a charter for no ads or no sponsors, unlike the BBC. I'll update this when I come across other examples of commercial activity on Netflix. A quick look at some of the biggest deals in media and technology last month, with some explanations for why the deal took place. Tenor is one of the biggest media companies that you'd never heard of. While Giphy had bigger brand recognition, Tenor has a similar offering, and has a similar reach. When users search for gifs to use in messenger apps like WhatsApp, Facebook Messenger, or even Twitter direct messages, they get either Tenor or Giphy assets. These companies make money by allowing brands to own keywords or phrases like 'Happy' or 'TGIF', and Tenor has billions of these searches each month to monetise. Unlike a lot of other searches, these are from people searching based on emotions and feelings, rather than intentions. The deal also allows Google into the Facebook, Twitter, WhatsApp etc ecosystems - until they block Tenor (which they presumably could do). I love this deal though - and in retrospect I should have seen it coming! This deal is about both regional consolidation in the taxi and logistics industries, and a recognition by the Uber board that they can't be big everywhere and that they need to focus on their core markets. It also seems possible that Uber is getting out of the business to business delivery business - Uber Freight - again to focus on taxis. Texture is an iOS app that gives you unlimited access to about 200 magazines for a $10 a month subscription. Android versions are available - try Readly - but this one for iPhones and tablets must attract a good, affluent audience base, the sort that Apple wants to keep loyal to their devices. I suspect that Apple won't change the app much, but might be able to offer combined subscriptions with Apple Music and other services. As Apple starts to focus more on content, this seems like a logical buy. Foxconn is well known for making lots of the tech that we use, from phones to gaming consoles, for companies like Apple and Nintendo. The purchase of computer accessories and peripherals brand Belkin shows that they may be looking to make more goods for themselves to brand and sell - which would presumably be a more lucrative (but risky) strategy.